Recently I stumbled upon a Kickstarter project called Open Legend RPG, an open source roleplaying game. The system is a labor of love that has been built over the last 4 years and was now ready to bring to a larger audience. The creators were raising money for printed additions, additional rulesets , and pre-made adventures, but the beauty of the system was that all the rules were online already; anyone could play it without spending a dime. Denoting software for which the original source code is made freely available and may be redistributed and modified. While this isn’t accurate in the truest sense for Open Legend, they provide an incredibly wide commercial and non-commercial license (currently under revision for clarity and more openness) so many parts can be reprinted and recreated. Years ago I contributed some effort to the now defunct open source project, Software for Starving Students. Since then my open source contributions have been limited, but Open Legend offered a new opportunity. I re-imagined and redesigned the layout for 3 core game elements: banes, boons, and feats. I then launched a micro-site under the HeroMuster domain where I can host the Open Legend RPG Toolkit. Responses have been favorable so far from the community, and with that encouragement I intend to build more tools that I could never create (and publicly release) for other systems (like Dungeons & Dragons). I’m happy with the work and the core ideals of this system, so feel free to check out the tools if you’re at all interested in Open Legend! Sidenote: The image above is a mashup of the Open Legend logo and the HeroMuster logo, which works incredibly well. 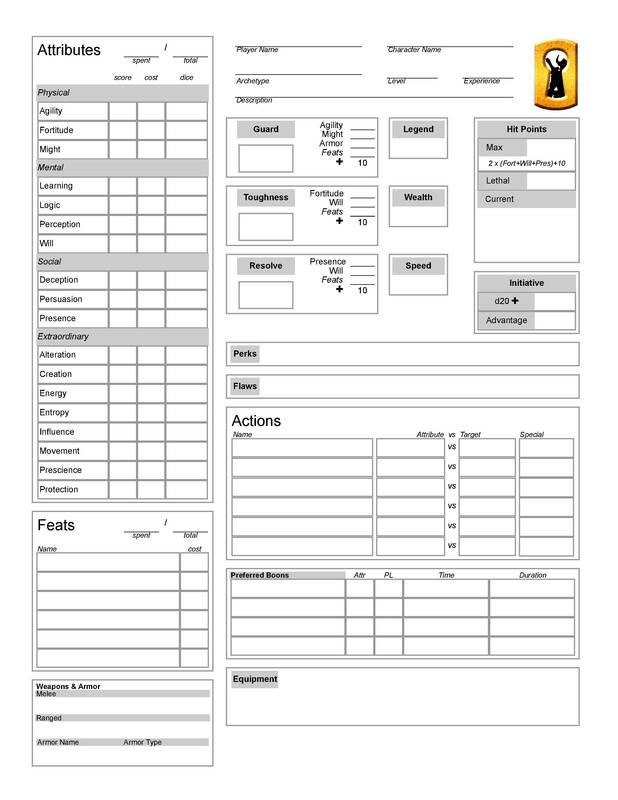 The site now includes a character creator for people to use, but to make it as widely available as possible, I’ve also created an Open Legend Character Sheet PDF and Open Legend Character Sheet JPG. This entry was posted in Websites and tagged Bootstrap, HeroMuster, open legend, roleplaying, rpg on December 10, 2016 by Mario Lurig.